In light of the ever-increasing cost of feeding our equine friends, making sure our horses are receiving good nutrition is more important than ever. 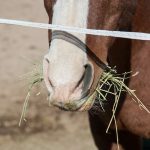 There are a couple of simple techniques that you can use to monitor whether or not your horse is receiving good nutrition that allow you to compensate for weight loss or gain more quickly than if you just “eyeball” your horse. The first is to familiarize yourself with Body Condition Scoring (BCS) systems. The Henneke BCS scoring system, developed for horses by Dr. Don Henneke, has become the equine industry standard for evaluating proper weight and is commonly used by veterinarians and other equine professionals to subjectively assess the horse. We highly recommend you take a look at this article from the University of Maine Co-op extension office – http://umaine.edu/publications/1010e/ – for one of the best explanations of the Henneke BCS system we’ve seen. By becoming familiar and comfortable with this system, and using it to assess your own horse, you can ensure that your horse is staying in the best possible shape for their job. As veterinarians, we recommend that most horses be a 5 or a 6 on the Henneke BCS scale (on a scale of 1 to 9). Most fit athletic horses are closer to a 5 while a fleshy athletic horse can easily be maintained at a 6. If you have any questions as to where YOUR horse falls on the scale, be sure to ask your veterinarian to assess your horses’ BCS the next time you see them. The second, equally important, method we recommend you use to keep track of your horses’ body condition is to get into the habit of regularly using a weight tape on your horse. 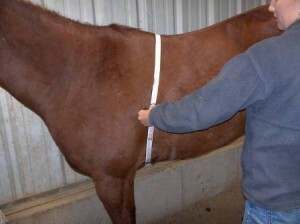 A weight tape measures the circumference of your horse and correlates that to a weight listed on the tape. While a weight tape does not always give the most accurate weight (for example a horse that actually weighs 1100 lbs may only “tape” at 950 lbs, or vice versa), it is an inexpensive and VERY useful way to track overall trends in your horses weight and BCS. 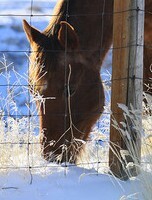 By taping your horse twice a month, you will be able to note changes in their condition more accurately. Even if the tape does not reflect the exact actual weight of your horse, if the tape says that they have lost 100 lbs since the last measurement, then they actually HAVE lost 100 lbs, and you can adjust their feed accordingly. By doing this you will be able to correct for caloric need changes in your horse much sooner than when you “notice that they have lost weight”. This can be a very useful and important tool, particularly during the winter. 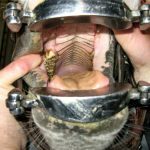 If you have any questions about these techniques or equine nutrition, be sure to talk to your veterinarian. Stay warm out there!